Dried fruit can be a healthy addition to your diet, good for providing vitamins, minerals and fiber without adding a lot of calories. Naturally low in fat, they pack a lot of carbohydrates into a small volume, making them a good food for endurance athletes, for example. Note that nutrients differ between fresh and dried; vitamin C, for instance, is usually lost during the drying process. Buy organic to avoid pesticide residues and preservatives such as sulfur dioxide, and look for unsweetened fruit to avoid added sugar. Dried organic apricots are usually a dull orange-brown color; the bright orange ones you see are usually imported from Turkey and are always treated with sulfur dioxide. One cup of dried apricots provides a good portion of the daily recommended amount of vitamin E, niacin, iron, potassium and calcium and a full day&#039;s supply of vitamin A. Fresh figs are highly perishable, so the art of drying and preserving figs for storage was developed long ago. Dried figs are especially high in calcium, iron, magnesium, potassium and vitamin K. They are also a very good source of fiber, even compared to other dried fruits. Dried cherries are a good source of vitamin A, with one cup providing a full day&#039;s allowance. They&#039;re also high in iron. So-called tart cherries do not need to be sweetened to be palatable, so seek out both sweet and tart varieties in an unsweetened form. Dried pineapple is rich in manganese and also a good source of potassium and the B vitamins. It is, however, lower in fiber than many other dried fruits. Dried pineapple is sometimes sold coated in sugar, as if it were candied. Avoid this form, and purchase the unsweetened kind instead; you may find it tastes slightly sour. Mango is the most popular fruit in the world, commonly consumed in both fresh and dried form. Dried mango is a good source of vitamin A and also provides decent amounts of vitamin B6, iron and calcium. Some dried mango is sweetened; other products add a dusting of chili powder for a sweet-hot effect. 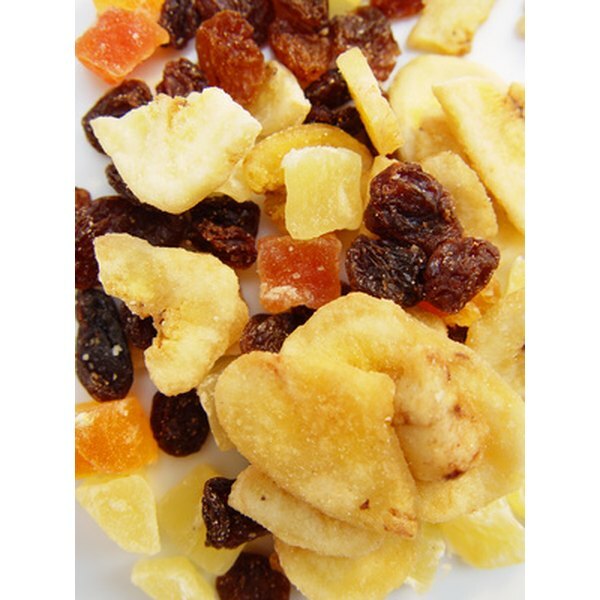 Raisins, the dried form of grapes, are the best-known and most commonly available dried fruit. They&#039;re packed with minerals, providing a good portion of the daily allowance of iron, potassium, manganese and calcium. They&#039;re also a good source of the B vitamin complex. Lifescript: Is Dried Fruit Really a Healthy Snack?